The purpose of the map section is to give a basic picture of where the main wine names are located, and to put the countries and regions in context with a few facts and figures. Being able to see where a wine comes from not only helps locate it in our memory, but often explains its style as well. Both are part of the pattern that helps make sense of this enormously diverse subject. Space limitations have meant it has been impossible to do justice to each country to the same extent, but there are numerous detailed wine atlases available to do this. 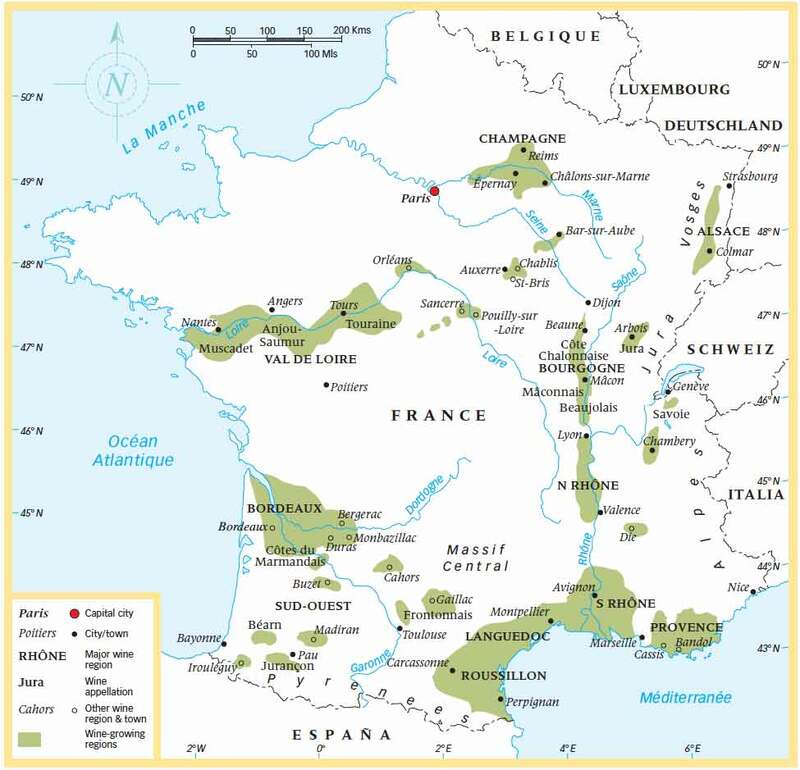 France takes the lion’s share because her regions, their wines and associated grape varieties, are not only well established, but also important reference points for many major grapes and wine styles. Clarity was the principal aim of these maps; I didn’t want them to be too cluttered. 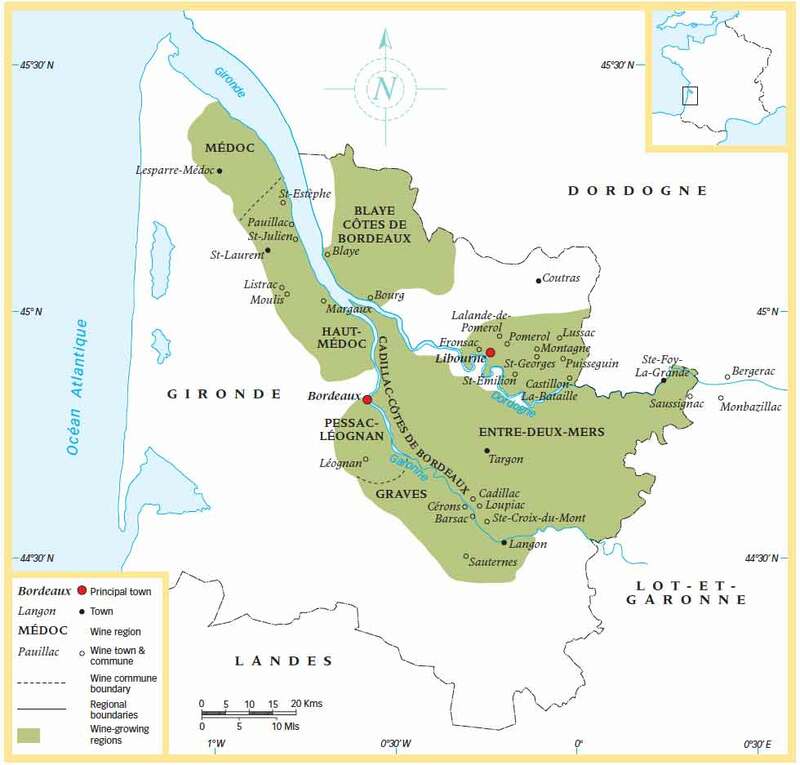 Thus, in order to avoid the duplication of names as far as possible, different typefaces have been used to distinguish between what is only a wine name – Côte-Rôtie, for example – and what is a wine name as well as the name of a village, town, region, etc – Sancerre, for example. It is not a hierarchical distinction. The key boxes are self-explanatory, and the system outlined above is consistent as far as possible, given the varying scales of the maps and the different methods of naming wines in different areas. Latitude has been included because it is interesting to compare one region with another within countries as well as across the globe. Latitude is also important for distinguishing between cooler / warmer regions and their consequent wine styles. These aim to provide a thumbnail statistical and grape variety sketch for each country or region. The production figures put major regions in context within a country, give an indication of the proportions of red and white wine, and relate each country’s 2015 production to the 2015 world production of 276 million hectolitres. The grape varieties shown feature for wine quality and local importance rather than quantity planted. Wine producers love the open air, not the grind of completing forms about their business. US Deptartment of Agriculture, have also provided much information.